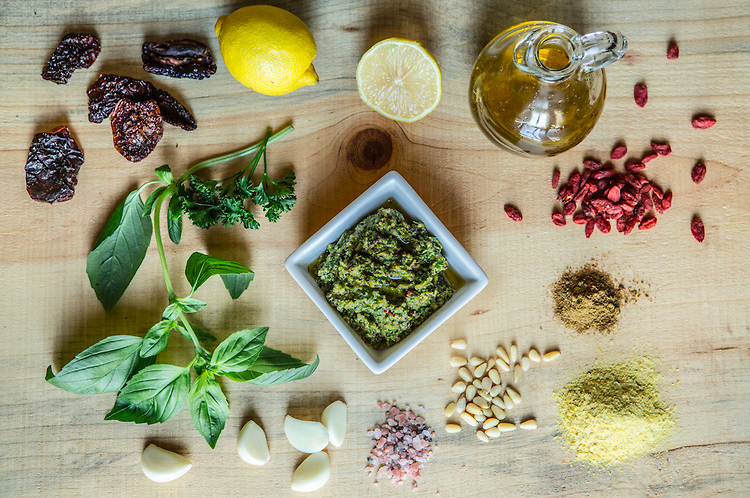 Even though there are many features in this particular pesto, it's actually the garlic and goji berries that stands out and will be keeping the colds and flu away. Garlic has anti-viral, anti-biotic, and anti-fungal properties. It destroys viruses and amazingly spares the good bacteria. A phytochemical in raw garlic called "Alliin" blocks the activity of angiotensin, which causes blood vessels to contract. This nutrient prevents unwanted contraction of blood vessels and increases in blood pressure. The goji berries are a great added superfood in there and have been known in Chinese medicine used for fertility, longevity and boost the immune system. Goji berries contains 18 amino acids, 21 minerals, glyconutrients for cell communication and more beta carotene than any other food on earth. Consumed regularly, these 2 will add years to your life without a doubt.